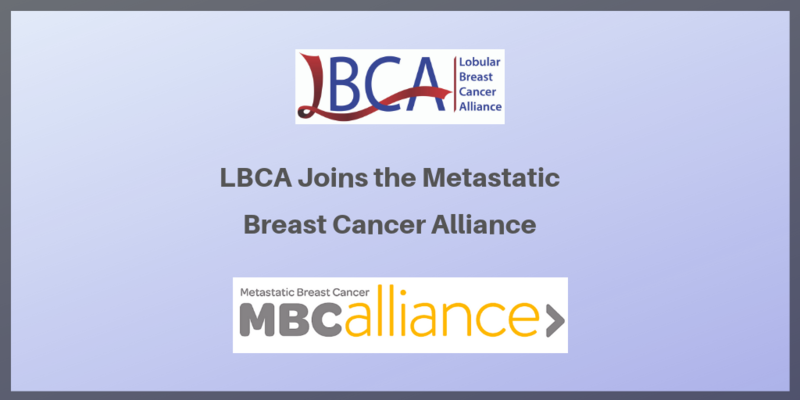 March, 2019: The Lobular Breast Cancer Alliance (LBCA) joined the Metastatic Breast Cancer Alliance (MBC Alliance) as a non-profit organization member. LBCA will work collaboratively with coalition partners to advance the MBC Alliance mission to improve the lives of, and outcomes for, those living with metastatic breast cancer and their families. Lobular breast cancer (ILC) is a unique histological subtype of breast cancer. 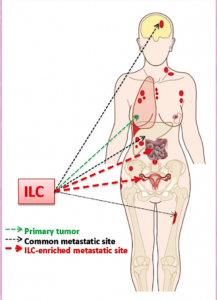 ILC can metastasize later than more common ductal breast cancers, often recurring many years after initial diagnosis. Lobular breast cancer spreads to unique locations in the body including the ovaries, the GI tract the abdominal wall and organs and the eye. It is frequently harder to see on advanced imaging, leading to difficult diagnosis and treatment. Patients with lobular breast cancer can find it difficult to enter clinical trials because their disease may not meet RECIST measurable criteria. Learn more about ILC. Currently there are no lobular-specific metastatic clinical trials in the US. The Metastatic Breast Cancer Alliance (MBC Alliance) is a coalition made up of representatives of nonprofit organizations and 11 pharmaceutical/biotech companies, along with 17 individual patient advocates – many of whom are living with MBC. The MBC Alliance increases awareness and education about MBC and advances policy and strategic coordination of research funding, specifically focused on metastasis, that has the potential to extend life, enhance quality of life, and ultimately to cure. The goals of the MBC Alliance are to advance MBC research, increase access to MBC information and support services, and increase awareness of how MBC is different from early stage breast cancer. For more information, visit www.mbcalliance.org. Use the topics or the search function below to find all news, events or educational resources on our site. Your tax-deductible donation will fund LBCA’s work to advance research and educate about Lobular Breast Cancer.